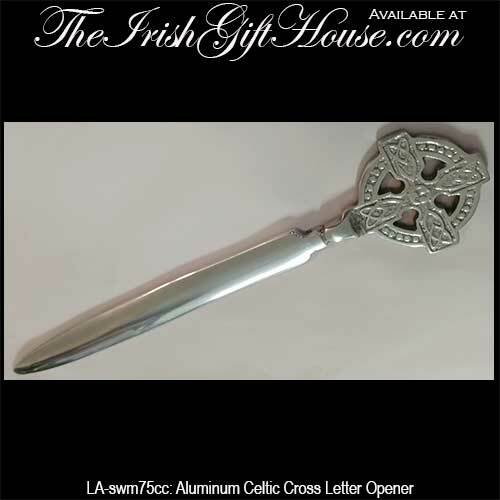 Irish letter opener features a Celtic cross along with aluminum construction. This Celtic cross paper knife is made in Ireland by Liffey Artefacts. 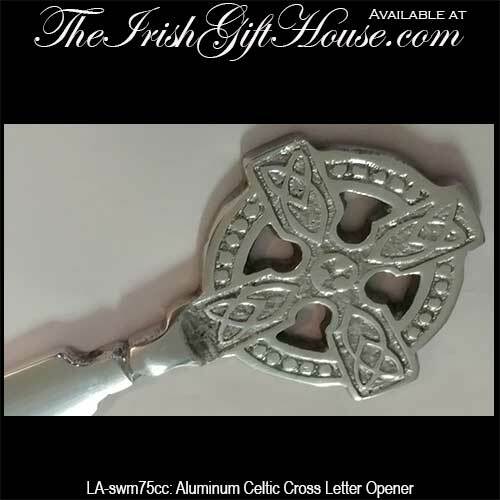 The Celtic cross letter opener is constructed of aluminum and measures 8” long. The 1 7/8" wide cross features embossed knot-work on both sides and it is gift boxed with Celtic knot and Celtic cross history cards, complements of The Irish Gift House. Brass Celtic cross letter opener is enhanced with a knot-work motif. The Claddagh letter opener is made of solid brass. This solid brass Irish letter opener is embellished with a double sided shamrock. This brass Celtic letter opener is features a Trinity knot.